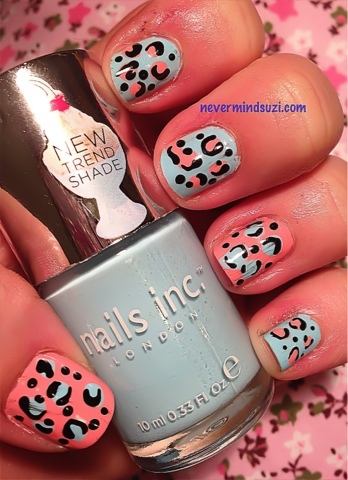 Today I've got 2 of the Nails Inc Summer Collection for you. Chelsea Psychic Garden is a pale pastel blue. It's a lot lighter than most pastel blues I have. It's spot on for the summer. Kensington Palace Gardens is a bright soft pink if that makes any sense? It's beautiful!! Put both of these beauties together and you're onto a sure winner. I went with an oldie but a goodie - leopard print. The color combo is gorgeous!! 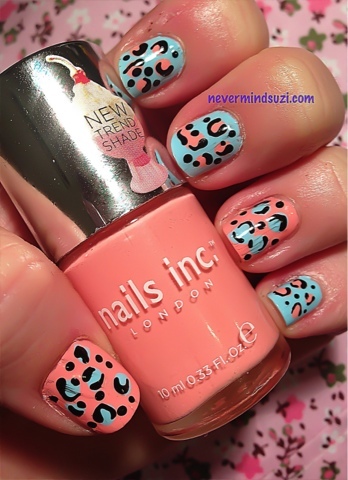 I love leopard print designs in contrasting colours... This looks so good!